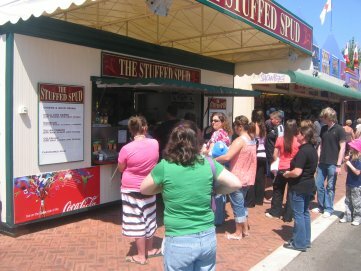 The Stuffed Spud operates 2 mobile catering units. a common garden type hose or similar. Waste water is pumped directly to a suitable outlet..
Has the capacity to both hold potable water and store slurry. On board tanks hold: 425 litres of potable water 450 litres of slurry. 32 OR 20 AMP 3 PHASE FEED. AS THIS WOULD PROVIDE MORE POWER THAN WE REQUIRE WE WOULD THEN BE ABLE TO ACCOMMODATE OTHER USERS ON OUR BOARD.